↑ "The Countries of the UK". Office for National Statistics. สืบค้นเมื่อ 24 June 2012. ↑ "Scottish Executive Resources" (PDF). Scotland in Short. Scottish Executive. 17 February 2007. สืบค้นเมื่อ 14 September 2006. ↑ "A quick guide to glasgow". Glasgow City Centre. สืบค้นเมื่อ 20 June 2012. ↑ The Scottish Adjacent Waters Boundaries Order. London: The Stationery Office Limited. 1999. ISBN 0-11-059052-X. สืบค้นเมื่อ 20 September 2007. ↑ Collier, J. G. (2001) Conflict of Laws (Third edition)(pdf) Cambridge University Press. "For the purposes of the English conflict of laws, every country in the world which is not part of England and Wales is a foreign country and its foreign laws. This means that not only totally foreign independent countries such as France or Russia ... are foreign countries but also British Colonies such as the Falkland Islands. 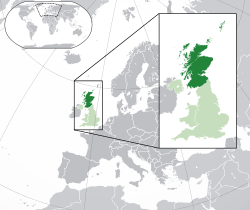 Moreover, the other parts of the United Kingdom – Scotland and Northern Ireland – are foreign countries for present purposes, as are the other British Islands, the Isle of Man, Jersey and Guernsey." ↑ Devine, T. M. (1999), The Scottish Nation 1700–2000, P.288–289, ISBN 0-14-023004-1 "created a new and powerful local state run by the Scottish bourgeoisie and reflecting their political and religious values. It was this local state, rather than a distant and usually indifferent Westminster authority, that in effect routinely governed Scotland"
↑ "Scotland: Independence Referendum Date Set". BSkyB. 21 March 2013. สืบค้นเมื่อ 4 May 2013. ↑ Gardham, Magnus (2 May 2011). "Holyrood election 2011: Alex Salmond: Referendum on Scottish independence by 2015". Daily Record. Scotland. สืบค้นเมื่อ 14 October 2011. ↑ "Scotland / Alba". British-Irish Council. สืบค้นเมื่อ 4 May 2013. ↑ The History Of Ireland. สืบค้นเมื่อ 17 September 2014. ↑ Ayto, John; Ian Crofton. Brewer's Britain & Ireland: The History, Culture, Folklore and Etymology of 7500 Places in These Islands. WN. ISBN 0-304-35385-X. Watson, Fiona, Scotland; From Prehistory to the Present. Tempus, 2003. 286 pp. Dumville, David N. (2001). "St Cathróe of Metz and the Hagiography of Exoticism". Irish Hagiography: Saints and Scholars. Dublin: Four Courts Press. pp. 172–176. ISBN 978-1-85182-486-1. MacLeod, Wilson (2004) Divided Gaels: Gaelic Cultural Identities in Scotland and Ireland: c.1200–1650. Oxford University Press. หน้านี้แก้ไขล่าสุดเมื่อวันที่ 5 มกราคม 2562 เวลา 13:38 น.